Drobo 5Dt. Image via Drobo. Anyone who has been a Mac user for any length of time is familiar with Drobo. The company pioneered fast, easy-to-use, expandable and affordable RAID storage a while back and is still at it, developing ever better versions of its products. Today we're looking at the Drobo 5Dt (US$899.99), a speed-optimized version of the Drobo 5D that features a pair of Thunderbolt 2 ports and an SSD cache for extra speed for the creative professional. We're giving away a Drobo 5Dt and five 2TB HDDs worth $284.95 to one lucky member of Team AWT, so if you're not already a subscriber, now's the time to sign up. Unlike some of the network-attached storage solutions sold by Drobo, the Drobo 5Dt is designed for direct connection to a single Mac. For extra speed and flexibility, you'll want to make the most of the two Thunderbolt 2 connections on the 5Dt, which means that it will work the fastest with a Thunderbolt 2-equipped Mac --- pretty much any recent Mac except the 12-inch Retina Display MacBook. Like the "non-turbo" Drobo 5D, the 5Dt has five empty slots for 3.5-inch drives of your choice. You can pretty much mix and match drives, which is one of the great advantages of Drobo devices. Drobo uses a proprietary system called BeyondRaid to make this possible, and BeyondRAID lets users switch to larger (or smaller) drives as their needs change, set up one or two drive redundancy (meaning that one or two drives can fail and still keep the full array functional), and performs other functions through the Drobo Dashboard application. Drobos have a lot of features to make them bulletproof, and the 5Dt is no exception. The device has a built-in battery backup system that keeps it running after a power failure long enough for all data to be written to the drive before gracefully shutting down. Twin Thunderbolt 2 ports, a SuperSpeed USB 3 port, power switch and power input. Image via Drobo. The "t" in 5Dt stands for Turbo, and the pair of Thunderbolt 2 ports on the device aren't the only thing that speeds up this model. The device also features a built-in 128GB mSATA SSD used as a Drobo Accelerator Cache, which keeps a copy of frequently accessed data so that it can be delivered to your Mac faster when you need it (see image below). Those Thunderbolt 2 ports mean that you can feel free to daisy chain a 4K monitor if you like! 128GB mSATA Accelerator Cache. Image via Drobo. One other great feature of the Drobo 5Dt is that it comes with free 3-year DroboCare that will have a replacement device sent to your home or office if anything goes wrong -- even before you send the non-working device back to the company. The warranty pretty much covers anything except drive failures, and fortunately you can recover from those easily by just replacing the bad drive with a new one and letting the Drobo rebuild it while you work. 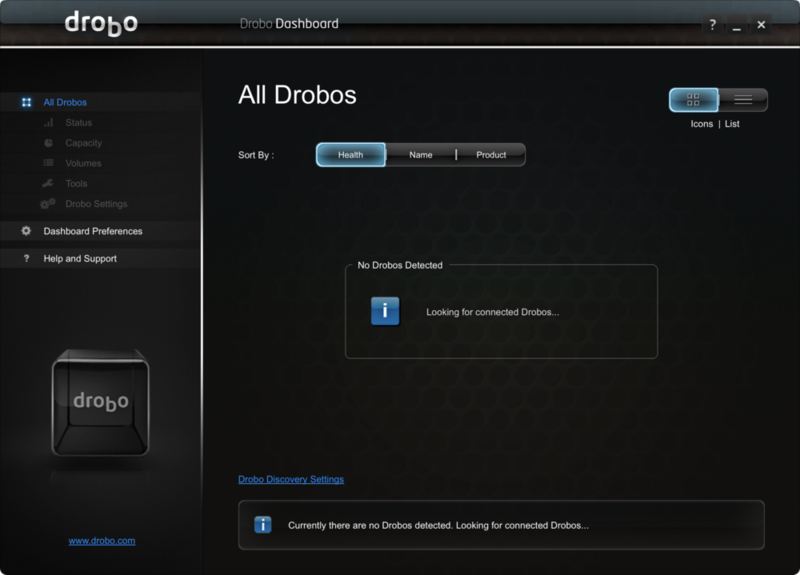 Setting up the Drobo 5Dt is very easy. 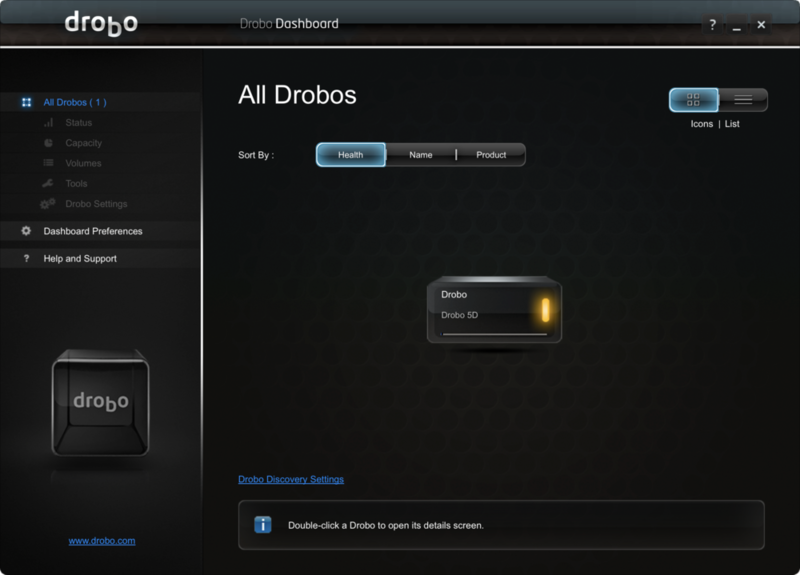 You start by downloading the Drobo Dashboard app from the Drobo website, then installing it on the Mac. Connect the included AC adapter to the Drobo, run the included Thunderbolt 2 cable between the computer and the Drobo, and Drobo Dashboard automatically recognizes the device. The Dashboard app (see screenshots below) checks for firmware updates and installs them if necessary, and then you're asked to give your volume a name and format the device. With five 2TB drives installed, the format took only a few seconds and then it was time to start running benchmarks. As usual, we used Intech Software's QuickBench, which is part of the SpeedTest Suite. QuickBench works by writing and reading small, medium-sized, and large files over and over again on the test drive, timing how long it takes to perform the read or write, and then calculating a speed in MB (megabytes) per second. As you can see, the larger the file size, the faster the read and write speed. That's quite typical of RAID arrays that we've tested. If you have a lot of large photo or video files that you'll be pulling from the Drobo 5Dt, you'll probably be quite happy with the speed. The Drobo 5Dt isn't just about speed, though; as with any RAID device, you're also looking at making sure that your data is safe from drive failures. For most people, setting up the Drobo 5Dt for single-drive redundancy -- meaning that one drive can fail and be replaced with no loss of data -- is going to be perfectly adequate. As mentioned earlier, the Drobo 5Dt can also be set up with dual drive redundancy, so two drives can fail at the same time and you can still rebuild them after replacing with new drives. The drives are hot-swappable; there's no need to power down the unit. And since the drives also just plug right into the Drobo, you don't need to screw them into a "sled" before installing them. Take a new drive out of its static-free bag and plug it into the Drobo, and it's ready to go in seconds. One feature that I've always liked about Drobo devices is that they are really good about telling you their status. They do this a couple of different ways; first, Drobo Dashboard alerts users of impending drive failures, shows how much space is available on the array, and so on. It's also possible to just see what's up with a glance at the device. If all of the individual drive bay lights are green, you're in good shape. A line of blue LEDs across the bottom indicates how much space is being used. Get into a situation where you might need to replace a drive or two with larger capacity drives, and you'll see yellow lights. When a single drive fails and needs to be replaced, a red light appears. Pop the drive out, plug in the replacement (almost any 3.5-inch HDD) and you're back in business. The Drobo Dashboard app lets you control the brightness of the status lights so that they don't light up a room if you're using the 5Dt in a home office. As drive sizes keep growing, it's easy to swap out smaller drives one at a time to increase the total capacity of the 5Dt. For example, with the five 2TB drives that we tested the Drobo 5Dt with, it has a capacity (single-disk redundancy) of 7.26TB. Swap out those drives for 8TB drives as the price drops on those, and the capacity grows to 29.05TB, once again with single-disk redundancy. Finally, the Drobo 5Dt can be used as a really large repository for Time Machine backups. It's possible to set aside a chunk of space just for Time Machine so that the backups don't fill up all of the space on the device, which is quite helpful in keeping Time Machine under control. With the Drobo 5Dt, Drobo has created a storage device that adds speed, cache memory, and battery backup to a product with a good track record of keeping data stored safely. The base product price of $899.99 puts it into the range of reality for creative professionals and businesses that need the expandable storage provided by the 5Dt. With the ability to hot-swap failed drives and add drives of larger capacities, the Drobo 5Dt gives users the flexibility to expand total storage as it becomes available and affordable. Thanks to Drobo, we're giving away one Drobo 5Dt with five 2TB drives. To enter this giveaway for this amazing device worth US$1184.94, you just need to be a member of Team AWT. Giveaways, as well as extra content in the form of a regular newsletter and patron podcast, are part of the benefits that we provide for those who help keep Apple World Today running through their monthly donation of $5 or more. If you're not a member of Team AWT, it's easy to find out more and join up. Welcome to Bruce Schmoetzer and Eric Weber, who just joined the Team, and thanks to Brian Murray for increasing his monthly donation! Once you're a member, click here to fill out the entry form for the Drobo 5Dt giveaway. Good luck! The winner will be announced on Apple World Today on September 1, 2016.